I have had a lifelong love of dogs and began my training journey in the shelter and rescue system working with some of the most unfortunate cases in the Baltimore area. Over the past few years, I have searched for opportunities to learn from the best in the business, attending conferences, seminars, and other training opportunities with amazing trainers from around the country. I passionately pursue this commitment to continuing education as a member of the IACP, The International Association of Canine Professionals. Fast forward and today, through Baltimore Dogworks, I am seeking to provide high quality, results based training as the foundation of communication, emotional stability, and the relationship between my clients and their companions. Additionally, my involvement with rescue organizations continues as I am committed to providing free training opportunities for dogs in foster care. Dogs have been a part of my life since I can remember. 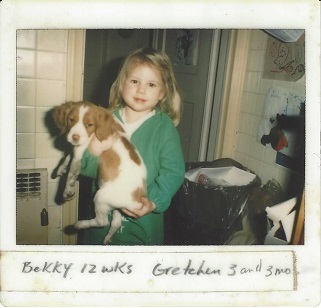 My first dog, a Brittany named Becky, was a gift from my parents for my 3rd birthday. From that point on I have always felt a connection with dogs. In my 20s I had a boxer named Tela who inspired me to learn more about canine behavior. Since her passing I have added three canine members to my family as well as many foster dogs who have ‘vacationed’ with me before finding their forever homes. Having the opportunity to work with and learn from other trainers near and far has given me a well-rounded perspective on training and behavior. My passion lies with puppies and helping clients to connect and communicate with their dog right from the start. The ability to take advantage of optimal learning opportunities during the critical developmental periods, before certain behaviors have a chance to manifest into problems, is priceless. I am a member of the International Association of Canine Professionals (A 5921) and have volunteered with local rescue groups. Additionally I am certified in Dog First Aid from the American Red Cross. Thanks for reading and I hope to meet you soon!